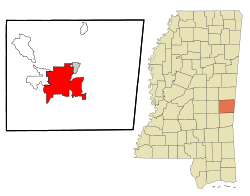 Meridian is the county seat of Lauderdale County in Mississippi, a state of the United States of America. Meridian is the sixth-largest city in the state of Mississippi and the principal city of the Meridian, Mississippi Micropolitan Statistical Area. The population was 39,968 at the 2000 census. The current population is larger than in the 2000 census. A recent annexation, in addition to seeing many displaced coastal residents after Hurricane Katrina (many of them have made Meridian their permanent residence), have put the population over 40,000. This page was last changed on 30 August 2018, at 06:41.